Original manuscripts in the Portland Literary Papers illustrate the satirical treatment of contemporary society, the court, prominent figures, and political affairs. John Wilmot, Earl of Rochester (1647-1680), English courtier and poet, is one of the most familiar names among the Restoration poets. The collection includes autograph works by both the Earl and Elizabeth, his Countess. 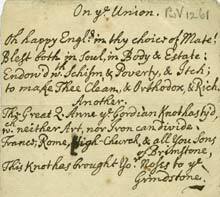 Rochester was credited with many obscene poems which circulated anonymously. It was common for satirical verses to be issued without attribution, particularly when the subject was political. A small fragment of paper records two anonymous four-line verses which refer to the Act of Union of 1707, by which the crowns of England and Scotland were joined and the Scottish parliament ceased to exist. 'A New Collection of Poems relating to State Affairs, from Oliver Cromwel to this present time' was published in London in 1705. It represents a popular genre, collections of political poems by a number of authors. Authorship was often uncertain, and modern scholarship has corrected many attributions. The most familiar of these miscellanies is the multi-volume Poems on Affairs of State (1697-1707) from which A New Collection was apparently pirated.